Bambari – Ethnic violence has plagued the Central African Republic (CAR) for decades—but community engagement has done much to soften the tension by bringing former antagonists together in meetings decidedly less lethal. One recent example is football. 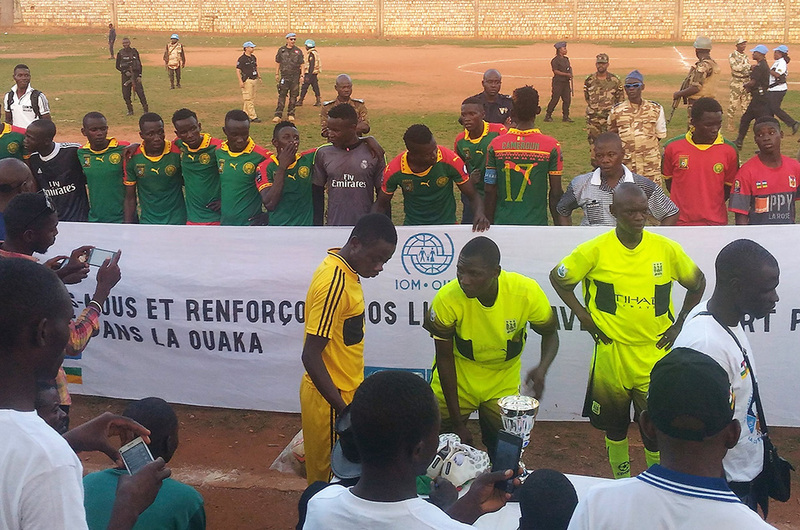 In the Ouaka prefect, IOM, the UN Migration Agency, has provided financial and technical support to the local football league cup final, a popular event across all ages and communities. Last weekend (25/02), football was used to promote IOM’s work in the city. During the opening ceremony, the Mayor of Bambari, the Prefect of Ouaka, and IOM Programme Officer Giacomo Gabbrielli highlighted the importance of sports as a means to promote peace and non-violence. These values were reaffirmed with a theatrical presentation during the half-time break on the risks related to the illegal circulation of arms, and their role in escalating conflicts rather than solving individual and community disputes. The cup final was also an opportunity to familiarize the supporters in attendance with IOM and its activities. 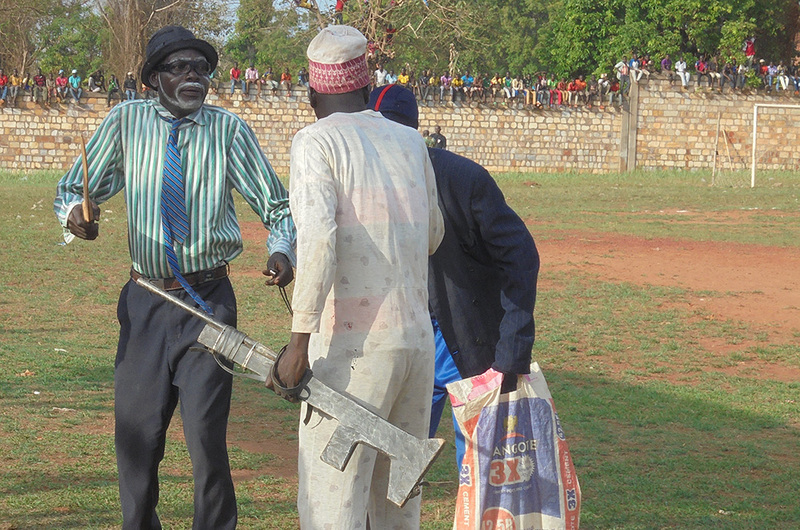 IOM opened its Bambari sub-office in December 2017, and is engaged in the Community Violence Reduction project financed by the Peace Building Support Office (PBSO) of the United Nations and MINUSCA (United Nations Multidimensional Integrated Stabilization Mission in the Central African Republic). The project aims to ameliorate the security situation through the reintegration of armed group members who are ineligible for the Disarmament, Demobilization and Reintegration programme or the mechanisms in place for intra- and inter-community dialogue for the prevention of violence and the peaceful resolution of conflicts. Local youth whom are not affiliated with armed groups, but for a lack of employment opportunities or other sources of revenue might resort to violence, are also targeted by the project. The game saw the two finalists, Sica Sport of Bambari and Ippy, battle it out at the municipal stadium in front of the local authorities, civil society organizations and 4,000 to 5,000 supporters. The atmosphere of the match was electric and saw Sica Sport of Bambari emerge victorious (final score 3–0). IOM covered the operational costs of the event and provided financial contributions to both teams during the award ceremony. The level of violence continues to rise in CAR as the fragmentation of armed groups has created new areas of tension, especially in the Central and North-western regions of the country. This has led to mounting humanitarian needs across the country, with half the population in need of assistance and 1 out of 4 with acute needs due to chronic vulnerability. This forced the humanitarian community to revise its three-year humanitarian plan for CAR in 2018, just one year after its launch. For the first time since 2014, the number of internally displaced people reached 600,000 last year, after experiencing a 50 per cent increase in 12 months. The number of people internally displaced now surpasses the number of Central African refugees in neighbouring countries.